Mayor Steve Adler of Austin: Tell Sister City, Gwangmyeong, South Korea, That We’re Opposed to the Torture and Consumption of Dogs and Cats. Gwangmyeong became Sister city with Austin in 2001. Gwangmyeong is one of the largest dog meat consumption areas in South Korea. There are countless dog slaughterhouses, markets and restaurants where the dogs, who are tortured their entire lives, end up being slaughtered in the most inhumane ways, such as by electrocution, hanging or beating; and then thrown into boiling water – sometimes while they are still alive. In many places, dogs are being killed in full view of other terrified, caged dogs; and this takes place in public and in broad daylight. In addition, many abandoned and stolen former pets end up in this industry, and are subjected to the same cruelty. 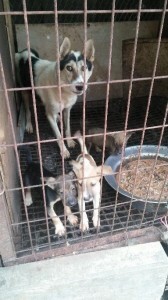 Dog Slaughterhouse in Gwangmyeong. CARE. Gwangmyeong prizes itself as being one of the most promising cities in Korea, and sees itself as an important central point for transportation and distribution out to other parts of the country. It states that the “great toil” made by its citizens is now becoming “a driving force for opening up a bright future”. A ‘bright future’, however, that is currently marred by the disturbingly cruel dog and cat-meat trades. A trade in which, every day, these defenseless and helpless creatures are intentionally terrorized, before being served up as food. 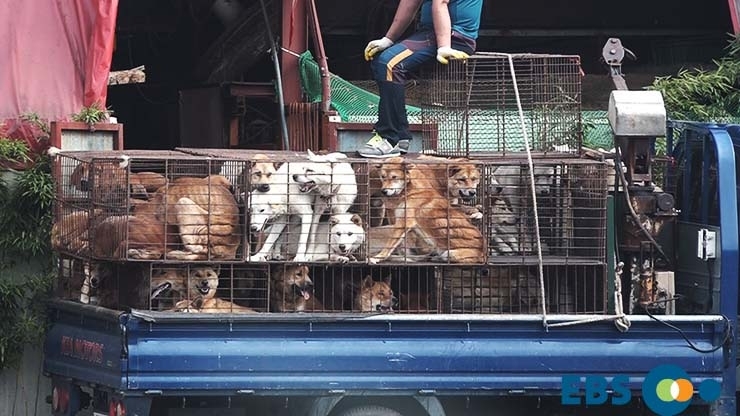 This cruelty carries on unchecked by government officials and flies in the face of the city’s desired reputation of being one of education and innovation, as well as its perceived standing of being ‘the best city’ in Korea, with regards to culture, tourism and economy. Let’s tell Gwangmyeong that their city cannot hope to be ‘the best’ or to enjoy ‘a bright future’ while it continues to harbour the dark and indifferent dog and cat-meat trades. Let’s tell Gwangmyeong that education is nothing without compassion. And, let’s tell Gwangmyeong that we want their citizens to prove they live in a promising city by becoming the driving force to end these trades. 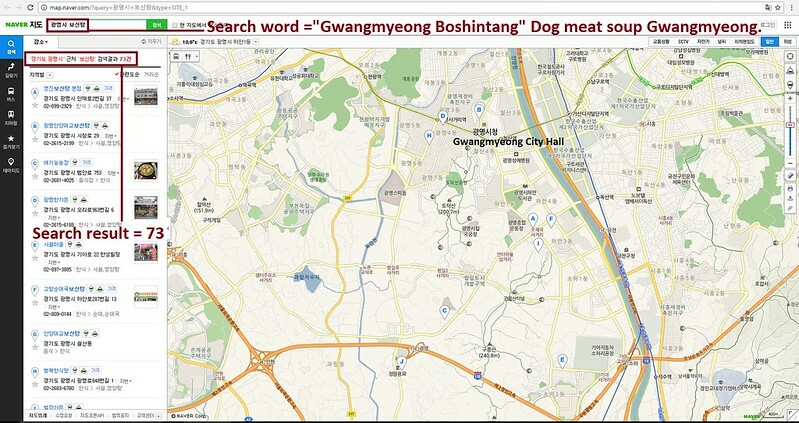 A Search Engine reveals the sickening scale of Gwangmyeong’s dog meat demand. 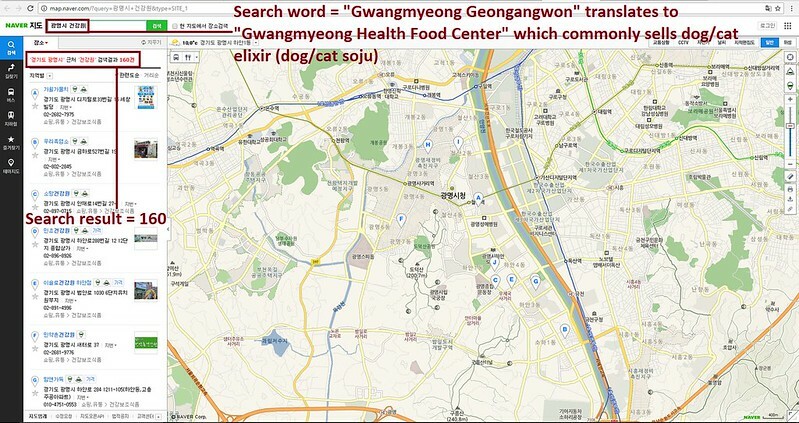 The searches resulted in: 160 Health Food Centers; and 73 restaurants in and around the city of Gwangmyeong alone. Even if half of these ‘Health’ Food Centers and restaurants serve dog and cat ‘ingredients’ in one form or another, just imagine how many dog/cat slaughterhouses must be present in and around Gwangmyeong in order to supply all of these outlets. Dog meat restaurants in Gwangmyeong, Korea. Please sign petition, call and email Austin Mayor Steve Adler TODAY! Click HERE to send an online message to the Mayor Adler. Click HERE to send an online message to the Marianne Z. Martinez, Sister Cities/International Program Coordinator. Gwangmyeong is one of the largest dog meat consumption areas in South Korea. The Korean internet searches resulted in: 160 Health Food Centers which commonly sell dog/cat elixirs (also known as dog soju and cat soju); and 73 dog meat soup restaurants in and around the city of Gwangmyeong alone. No matter where you live PLEASE SHARE these actions with your friends – especially those who live in Austin! Please, stop this. Have you no humanity? Dogs were created by man to provide companionship to mankind. To torture and consume them is so wrong & disgusting, I’m at a loss for words.